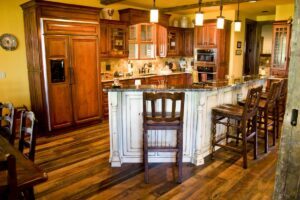 Building a new home or updating your kitchen? There are so many options and ideas to consider for kitchen cabinet styles, hardware choices, colors, finishes and more. The right kitchen cabinets can make or break your kitchen’s functionality and style — not to mention your budget. Let our team help you select the kitchen cabinet that will make your kitchen a focal part of your home. Our team can walk you through the process, from start to finish. There are many resource guides online covering everything from Shaker to flat panel, from corbels to aprons, from glass knobs to recessed pulls. Shaker, flat or inset? Your cabinet door style is important — it may be your biggest kitchen expense, after all — but choosing it doesn’t have to be stressful. Which of these popular cabinet doors fit with your home’s style. Who says cabinets have to be all wood? Installing some clear glass doors allows you to put your best dishes on display and open up your kitchen to light and space with glass cabinets. Get creative! Go beyond the standard swinging door in your new kitchen. Flip-up doors, pocket doors and corner drawers can make your cabinets more functional and your life easier. If you’d rather stick with something more traditional for your cabinets, then the timeless Shaker style may be for you. You can make this look work with different counter, hardware and backsplash materials. Add a more traditional furniture style to your kitchen storage with a countertop hutch. Glass fronts make these the perfect place to put pretty dishes on display. Open shelving feels as much at home in modern kitchens as it does in traditional ones. See how to make this simple, clean storage style work in your home. Can’t decide between two different styles? Mix and match — two different cabinet styles can make an even bigger impact. Of course, once you have your cabinets chosen, you have a whole other task ahead of you: choosing hardware. Even if you’ve got simple Shaker cabinets like these, your choice of drawer pulls and knobs makes a big difference in your finished look. During each project, we keep our clients continually updated via e-mails and phone calls. We send photos with detailed information of the progress. We stay in good communication with our clients and we issue statements and invoices more frequently than many other Blowing Rock contractors, so that our clients don’t experience unpleasant budget surprises. Fairbanks Home Builders has completed many homes and renovation projects in Boone and Blowing Rock. A few of the projects completed by our professional Blowing Rock contractors include Mossy Creek, Elk River (a gated community), downtown Blowing Rock, and many of the homes in the Council Oaks Boone development. From kitchen remodels to custom homes, we welcome to opportunity to work with you to create your masterpiece.